David Bryant was valet to President Woodrow Wilson’s father, the Rev. Dr. Joseph R. Wilson who was minister at First Presbyterian Church from 1874 until 1885. The future President spent a lot of recuperative time in Wilmington during those years, because of various health problems. Louis T. Moore, in his book Stories Old and New of the Cape Fear Region, said Bryant “guarded” the frail young man when he swam in the Cape Fear River, at the foot of Orange Street. Bryant remained a cherished friend of the President, who invited him to his inaugurations and enjoyed reminiscing with him about his father. In 1909 Frank H. Packer sculpted the George Davis Memorial. Though the statue was sponsored officially by the United Daughters of the Confederacy, led by Gabriella deRosset Waddell, James Sprunt and Henry Walters footed most of the bill. The soaring prose inscribed on the eastern side of the monument came from a speech George Davis delivered at Thalian Hall, words that were reprinted in South Atlantic Magazine in 1879. James Sprunt’s brother-in-law, accomplished architect Kenneth Murchison, designed the monument. Packer used materials from Balfour Pink Granite Company and Gorham Bronze to create the memorial. Individuals who had known Davis, Mr. and Mrs. Hugh MacRae and Mrs. M. F. H. Gouverneur, viewed clay models in Mr. Packer’s New York studio and offered suggestions that helped the sculptor fine-tune his work before casting the image. “When I uncovered the (clay) statue, the work impressed me so satisfactorily that I called my plaster moulder to begin work at once,” Packer wrote James Sprunt. The builder incorporated a time capsule into the statue. The contents include: an 1865 letter from Jefferson Davis, president of the Confederacy, to George Davis; a memorial to George Davis, compiled by James Sprunt; a photograph of Colonel John L. Cantwell and a package of Confederate money. George Davis was born in 1820 on his father’s plantation at Porter’s Neck. He began to practice law in 1840 and served as general counsel for the Wilmington and Weldon Railroad. Davis quickly established a reputation as an orator and a formidable debater. 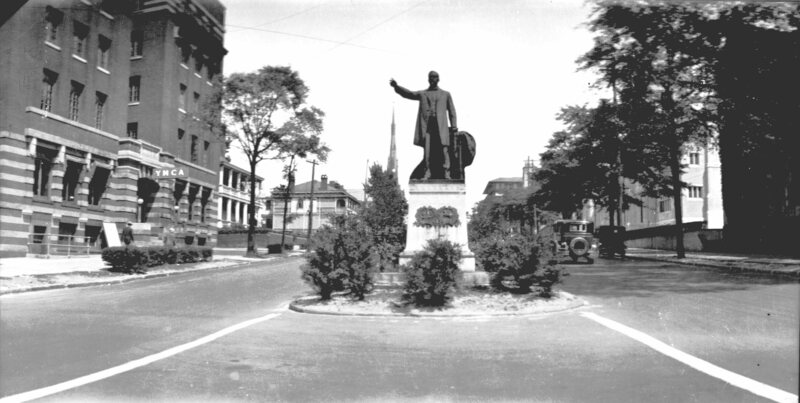 When famous orator Edward Everett visited Wilmington, in 1859, George Davis was chosen to introduce him to the audience. Reports were that Davis’s eloquence exceeded that of the illustrious guest speaker. In 1861, Davis reportedly entertained Robert E. Lee and Mrs. Jefferson Davis at his home on Second Street, between Red Cross and Walnut. Though he served as attorney general of the Confederacy, after the war ended George Davis declared, “Slavery is in the grave and nothing can disturb its eternal rest. I would not, if I could, raise it from the dead. The slave is free.” Mr. Davis died in 1896. Public Works Commissioner J. E. L. Wade (1889-1980) also posed in Post Office Park. Mr. Wade had a hand in virtually every civic celebration, program, or plan that sprang from the 1920s and 1930s. In addition to the World’s Largest Living Christmas Tree, Wade was a steady, stubborn force in promoting Greenfield Lake’s beautification; honoring Wilmington’s military heroes; campaigning for better roads; helping secure the Community Drive civic welfare program; and requesting government help to improve Wilmington’s port. Later, he worked on Azalea Festival projects and tried to find ways to ease Wilmington’s problems after the Atlantic Coast Line Railroad headquarters were relocated to Jacksonville, Florida.